During debugging of your application, you may need to keep track of some data which are already out of scope. Say, You call a MethodB() from MethodA() and did some operation inside MethodB(), now when you returned back to MethodA(), all the local variables inside MethodB() are out of scope. But you want to use them in MethodA(). Now here is the trick, that you can create an ObjectID for an member variables or objects and can track the same when it’s out of scope as well, but until GC() does not collect it. In this post, I am going to explore how we can use an Out of Scope object value to deal with Conditional Break points. To start with, first you have to understand how to use Object ID to track and out of scope object. Here is my complete article How to track an object which is Out of Scope while Debugging ? . Well that was the simple enough code. Objective is to see how things works with Out of scope object. Now, come to the exact point, You want to check some data value before print the data in console in MethodA() and you want to make sure that, Your breakpoint will only stop if the Student Name is same as object create in MethodB(). 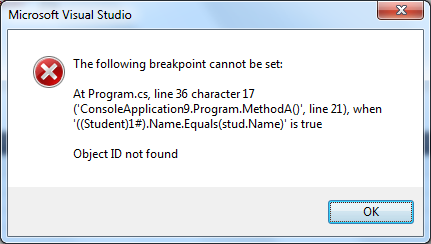 So, you have to put a conditional breakpoint over here. But does conditional breakpoint is sufficient to stop your breakpoint ? well yes, but you have to deal with some object which is not in current scope. From the above image, you can see how I have created an object ID ( 1#) from the object “stud” in MethodB(). Now, the next step is, using the Object ID in Conditional Breakpoint at MethodA(). That’s all, Now, your breakpoint at “Console.WriteLine” will only hit when the local student object name will be same with the stud object at methodB() ( 1#) name. From above image you can see, break point stopped when object ID (1#)’s name same as current object’s name value. If you have multiple name that matched with object ID’s value, your breakpoint will stop multiple time. Note : After create the object ID if you stop and restart the debugging again, if you have to create the Object ID once again. other wise you will get error “Object ID not Found” also when GC() collect the object.